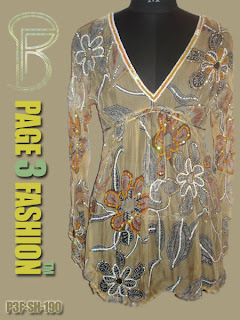 Astonishing beige color, V neck, and long sleeve top has lavish embellishment work and stunning designing for any luxurious event/party. This has an enticing appeal to the wearer. •	Exclusive and alluring designing for any party. •	Well finished with best quality material. •	Stylish and comfortable appeal for wearer. Have gracious embellishment work on it.